Here’s a look at today’s new, third party, and accessory releases. Raging Swan Press continues spicing up your dungeons in their latest Dungeon Dressing supplement for Pathfinder – Legends II [view our entry in the Roleplayers Chronicle Reference database here]. “This instalment of Dungeon Dressing presents 50 great legends to add to your dungeon. Designed to be used both during preparation or actual play, Dungeon Dressing: Legends II is an invaluable addition to any GM’s armoury!” Written by Pierre van Rooden, it’s available for purchase from DriveThruRPG: Dungeon Dressing: Legends II. The latest Year of the Demon Pathfinder Society scenarios are now available from Paizo Publishing. “In the Realm of Man, there is more to fear than the Pure Legion. Despite their rigid enforcement of the ban on divine worship, your Pathfinder Society agent must venture into Rahadoum’s borders to help aid the Society’s efforts in the demon-infested Worldwound. In “Port Godless” for 5th to 9th level characters, agents must find missing Riftwardens to aid their goals in the Worldwound, but they will need help. A former Pathfinder Society member has clues to their whereabouts, but after his falling out with the leaders of the Pathfinder Society, he may need some convincing to offer his aid. (Members of the Cheliax, Osirion, and Qadira factions won’t want to miss this scenario, as it will help them progress their faction’s goals for Season 5! )” Purchase the latest scenarios from Paizo Publishing here. Necromancers of the Northwest [visit their website here] has released their latest Exotic Encounters supplement for Pathfinder featuring Centaurs. “This particular installment of Exotic Encounters focuses on the centaur. These icons of Greek mythology have fulfilled many roles in fantasy media, from savage barbarian stand-ins for Mongols, Huns, and other nomadic horselords, to fey-like guardians of nature and wilderness, with many roles in between. In Pathfinder, their lowly CR 3 status and the fact that their horselike bodies don’t really belong in underground dungeons means that many adventurers may never encounter one, but the new centaurs in this book may just change all that.” Written by Alex Riggs and Joshua Zaback, it’s available for purchase from DriveThruRPG: Exotic Encounters: Centaurs. Legendary Games [visit their website here] has released a new Pathfinder adventure module – Feasting at Lanterngeist. “A simple harvest festival in an unremarkable village turns horribly, terribly wrong, in a way they can only when adventurers are involved. A simple disappearance threatens to become a massacre as a hidden menace long slumbering prepares to burst forth in the midst of this rustic revel. Will your heroes be able to thwart this menace, or will they become a part of the Feasting at Lanterngeist?” Written by Greg A. Vaughan, it’s available for purchase from DriveThruRPG: Feasting at Lanterngeist. D101 Games [visit their website here] has now released for general availability the new 2nd Edition core rulebook of OpenQuest. “A complete and easy to play Fantasy Roleplaying game, with monsters, magic and exotic locales. OpenQuest uses the classic D100 rules mechanic, which uses percentages to express the chance of success or failure. This is the 2nd Edition of the game in full colour with 80 new pages of content. 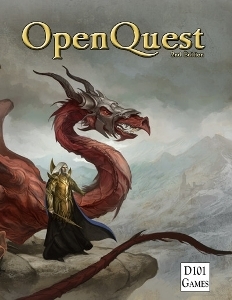 The Deluxe version of the game aims to be a self contained game with rules and advice on how to run a full campaign where the adventurers progress from their poor and ill experienced beginnings to the lofty heights of Godhood!” Written by Newt Newport, Simon Bray, and Paul Mitchener, it’s available in PDF and POD from DriveThruRPG: OpenQuest 2 Deluxe. Cubicle 7 Entertainment has launched the pre-order for a new Victorian fantasy steampunk campaign for Victoriana – Streets of Shadow [view our entry in the Roleplayers Chronicle Reference database here]. “There are dangers lurking in the shadows of the Smoke – and some of the most dangerous are stirring at the wrong time. With the War in the Crimea going badly for the British, the rumour of conscription has sent anarchists into the street. Against the backdrop of social unrest and increasing danger a web of troubles grows, culminating in a fearsome threat to the entire city.” Written by Walt Ciechanowski, Kristian Bjorkelo, Chad Bowser, and Peter Shweighofer, it’s available for pre-order from the Cubicle 7 webstore: Streets of Shadow + PDF **Pre-order – PDF due Nov, Physical copies due Dec/Jan**. Mongoose Publishing has released a new historical fantasy horror supplement for Deus Vult – Sanctuaries [view our entry in the Roleplayers Chronicle Reference database here]. “Though the Order’s strength is greatest in northern Europe, its power and influence stretch far beyond the walls of the Mont St. Michel and the borders of France. Across the Holy Roman Empire and the kingdoms of the Mediterranean it maintains priories from which its members may pursue their struggle against the enemies of Christendom. Beyond these, in storied Egypt and mysterious Cyprus, lone outposts guard against the depredations of sorcery and blasphemies of the infidel, for monsters in the night never sleep, and there are but few who can stand against them.” Written by Carl Walmsley, it’s available for purchase from DriveThruRPG: Legend/Deus Vult: Sanctuaries. Arcana Creations [visit their website here] has released a new adventure module for Swords & Wizardry – A Trick on the Train. “Enter a harsh and unforgiving tundra known as the Tain where traveling these lands means certain death for most. The party of adventurers become caught up in the the plight of the native inhabitants and the cruel designs of an evil hag. The actions of these heroes could bring about the end of a people or save them depending on the choice they make.” Written by Keith Hackwood, it’s available for purchase from DriveThruRPG: A Trick on the Tain (S&W). Mayhem in Paper [visit their website here] has launched a new series of paper miniatures called Fantasy Armies, starting with four new sets featuring Skeletons and Wraithlords. ” Set of 10 skeletal infantry figures armed with swords and shields, complete with an additional set of command figures: 2 banner bearers, 2 musicians and 3 regimental leaders; set of 12 banners.” Designed by J. Hartman, they’re available for purchase from DriveThruRPG. DramaScape has released their latest free modern battlemap featuring a Treatment Room [view our entry in the Roleplayers Chronicle Reference database here. “The treatment room is a single map of a surgery room. The product includes a 360-degree panoramic view of the room. The treatment room is intended for use in modern or near future science fiction settings.” Designed by Simon Powell, Steven Black, and Vidar Edland, it’s available for purchase from DriveThruRPG: Treatment Room. Forbidden Lands: Spire of Quetzel Compendium Launches + Bundle Returns!